"KANON"is a new Japanese Koto with doremi scales covering seventeenth chords,or about half of the two octaves. The "do(C)"and "so(G)"are specially colored with blue and yellow,so even beginners can have peace of mind playing Japanese Koto sound. Koto is made of paulownia. While the right hand plucks the strings,the left hand presses the strings behind the bridge(kotoji)to alter the tone. KANON is 120cm length which is 2/3 of traditional Koto and only 4kg weight.It's quite easy to carry too! Having doremi scales,KANON makes it easy to play not only Japanese music,but also classical music,jazz,pops and other world music. An ensemble with other musical instruments is possible too. We would like to spread this Koto and Japanese culture around the world! This porogram will be directed by Masako Naito(at the right back);a representative of Doremi pop-corn club, and Akari Naito(at the left back). Kanon instructor program will start from March 9th to April 5th,2016 in Nagahama city,Shiga. We are looking for passionate individuals who love koto sound and have interest to be Kanon's instructors. 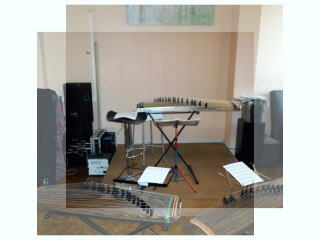 Koto experiences are not essential,but experiences with musical instruments are preferable. In this program,you will learn Koto technique,Koto knowledge, and Koto teaching method. You will also perform a tune for annual concert of Doremi pop-corn club held on April 3rd. In this concert,we invite guest musicians over the world and all participants enjoy an ensemble with them in the finale. At the end of this program,you will take a practical test to qualify Kanon's instructor. We will support you continuously with skype lessons after you go back home. *Accommodation,instructor license,koto rental,koto picks and textbook are all included. *Skype support lesson fee after the program is 3,000 JPY per hour. ●Requirement for participants:Japanese or English speakers who can read a music score. *This program will be explained in both Japanese and English. *The result will be informed within a week after your application document is received. Our optional programs offer a special opportunity to experience traditional and modern Japanese culture. *These fees are charged separetely.You can reserve after your arrival. *These are just some parts. All facilities are located inside one building. Doremi pop-corn club lesson studio and accomodation facilities are connected with the short stairs and the passage. 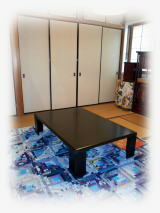 There are two bed rooms and one washitsu(Japanese style tatami room). You will either stay in a single or duble room and must be prepared to share with another participant.A toilet and a bathroom to be shared with all residents. The kitchen and the dining room are usable anytime. Please note you need to prepare your own meal during your stay.Free bread,cereal,tea or coffee are available for your breakfast. There are two shopping centers and some restrants nearby.One shopping center across the street is opend 24hrs for groceries,so it's very convenient to get your food. ･The program fee 210,000JPY(including accomodation), to be paid via Paypal within 14days after the application is accepted.If the payment is not confirmed after 14 days,the application will be invalid. *10% of the fee will be charged by 30 to 14days before the first date of the program. *50% of the fee wil lbe charged by 13 to 4 days before the first date of the program. *100% of the fee will be charged by 3 to 1 days before the first date of the program. 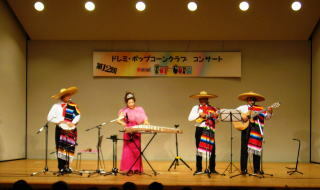 With a Mexican folklore group"Amankay"
･Started playing koto and shamisen from a young age. ･Graduated from Seiha music school where developed professional koto musicians. ･Studied under Yasuko Nakajima,a representative of Seiha Ikutaryu and learned jazz theory from Akikazu Nakamura and Takeshi Yamaguchi. ･Her musical performance in Germany in the Summer of 2000 very well received. ･In 2000, she developed a new type of koto,”Doremi pop-corn” (now changed to "Kanon") and established its music school ”Doremi pop-corn club”in 2001. She also works as A representative of Doremi pop corn club. ･Her music style is full of variety including traditional Japanese music,classical,jazz ,Latin and folk music. She played koto with western music in Switzerland,Germany,Monaco the U.S.,and Brazil so far.At the same time,she also held workshops in Switzerland and Germany in 2010,2014 and in Brazil in 2013. ･This new koto was introduced as an “epoch-making koto”in a technical book of “The Koto” published in the U.S.in 2004(written by Henry Johnson, a researcher of ethnic music). 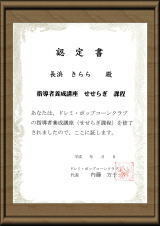 ･From 2011, Masako opened a new course named ”An Easy Koto Lesson”for elementary and junior high school students, which was a part of “The sightseeing promotion and the regional vitalization enterprise activating cultural heritage”authorized by the Agency for cultural affairs. She dedicates herself to instruct children besides her music activities. 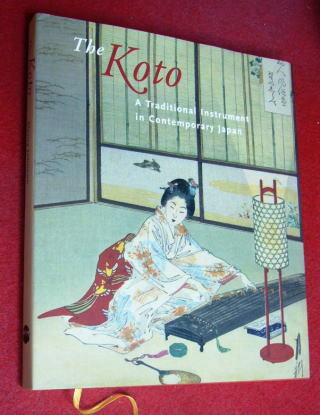 ◆Appeared in the technical book,"THE KOTO"
I appreciate of your interest for Kanon's instructor program. 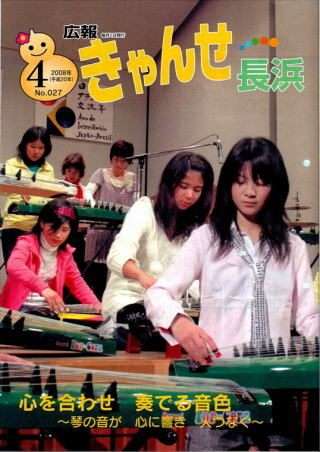 If you like music and Koto,it won't be so difficult to learn Kanon.You would master a variety of music as you enjoy. I used to play traditional Koto from childhood.However,it's hard to carry because of its size(180cm) especially traveling abroad.Having a different musical scale(a pentatonic scale) and score,it's also difficult to play with other western musical instruments. I wanted to play various genres of music and play with musical instruments over the world and it motivated me to develop the new Koto. 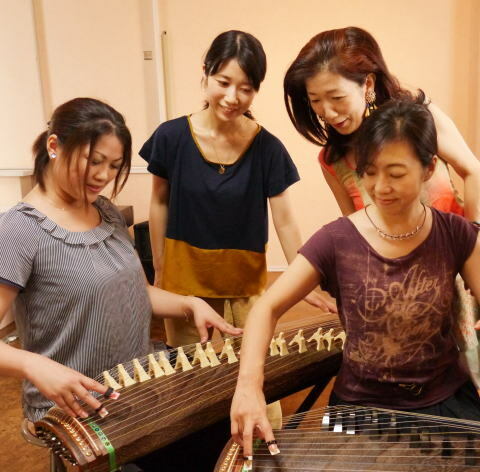 Since I developed this Koto,my life completely changed.I could meet and play with the musicians around the world.I also had chances to perform in Swiss,Germany,Monaco,the U.S.and Brazil so far.Whenever I play Koto overseas,I feel music has no border.We can get together and enjoy the moment without words.This is one of the greatest things about music. Our music activities are opening to the world! Won't you become Kanon's instructor and travel around the world with us? I'm waiting for your participation and looking forward to playing with you! Shiga prefecture is located in the center of "Honshu",the main island of Japan and between the major cities of Osaka and Nagoya. 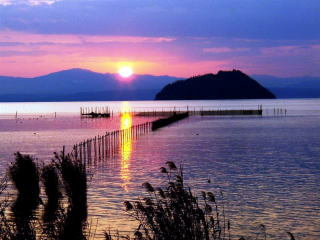 It is the site of "Biwako",the largest lake in Japan.Having 4 million years history ,it is also called "Mother lake"and it takes an important role to provide water in industry,agriculture, and supporting the lives of the people live in western Japan. Once there was an imperial capital in Otsu, when Emperor Tenji moved from Kyoto in 667. 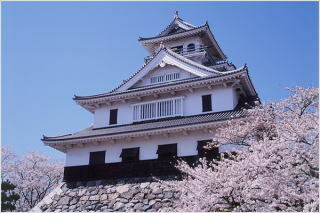 Thereby Shiga has many historical sites such as temples,shrines,castels with beautiful nature. It takes only an hour to Kyoto and 1.5 hour to Osaka and Nagoya by JR line. Nagahama was a castle town since Toyotomi Hideyoshi ruled this area in the late 16th century. Although the castle had been ruined,it was reconstructed in 1983 and is open as Nagahama castle historical museum. Kurokabe square is one of the most popular spots in Shiga.There are some glass galleries and studios,shops,restaurants and cafes.You can enjoy touring around! Please fill out the items below. We'll send an application document with some inquiries to your e-mail. 398-1,Kobori cho, Nagahama city,Shiga Pref. Copyright © 2013 DOREMI POP-CORN CLUB. All Rights Reserved.